Peyton Hillis beat out Michael Vick for the cover of the Madden NFL 12 video game. At approximately 5:00 pm Eastern Time today, ESPN2 announced that Cleveland Browns’ running back Peyton Hillis beat out Michael Vick as cover athlete for the Madden NFL 12 video game. This, on the same day that Android (the operating system owned by Google) apparently caved to protest and removed the controversial Dog Wars video game from its inventory. Clearly though, someone took notice. Was it the letter that Alicia Silverstone sent to the app’s developer, Kage Games, imploring them to cancel the release? Was it Vick’s tepid, matter-of-fact statement (released in partnership with HSUS) that swayed execs at Android or Google? Somehow I doubt the football player is responsible. Maybe it’s wrong for me to pick on poor Vick today, but I expected a little more from his PR team and image-rehab strategists. Vick’s impassive statement begins with how dog fighting was a dead end for him (a dead end for him?) — the issue of animal cruelty is second. 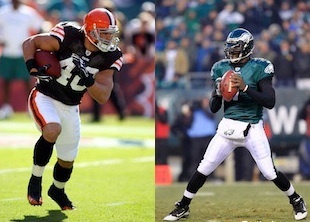 Go ahead, chastise me for being unwilling to admit that Vick can do anything right. It’s true: There is no redemption or argument for forgiveness in my mind. A handful of required speaking engagements doesn’t count as genuine action. The cowardly cancellation of his Oprah appearance and the rebuff he gave the owner of one of his former dogs are far more indicative of his character than are ten minutes with receptive school kids every few months. Don’t feel too bad for Michael Vick. He’s got a sweet gig, makes plenty of money, is slowly accumulating endorsement contracts, and landed secondplace in an NFL popularity contest. Life is good for the man who says he wouldn’t change one thing — not one, Mel and Hector! — about his past.